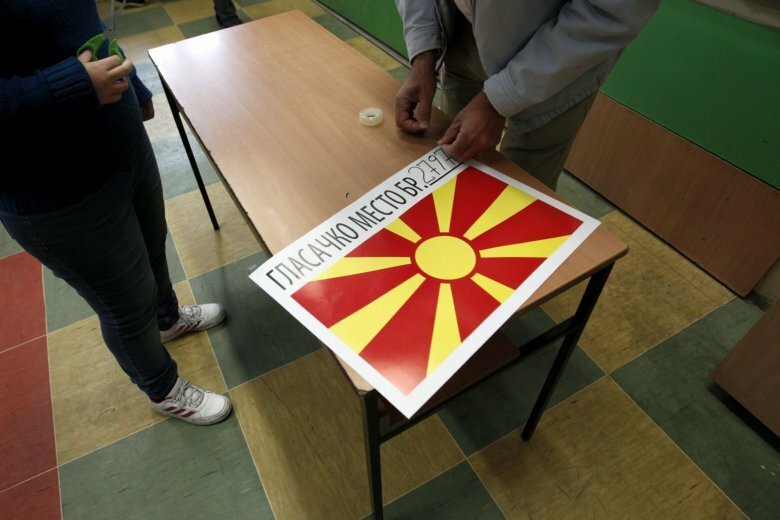 SKOPJE, Macedonia (AP) — A referendum on changing Macedonia’s name as part of a deal that would pave the way for NATO membership won overwhelming support Sunday, but low voter turnout highlighted the hurdles that still remain for the Balkan country to join the alliance. Prime Minister Zoran Zaev had hoped for a strong show of support in the referendum on whether to accept a June deal with Greece changing the country’s name to North Macedonia. That would help him with the next step of winning parliamentary support for the required constitutional amendments. Results from more than 97 percent of polling stations showed 91.3 percent of voters approving the deal. But turnout stood at just 36.8 percent, a far cry from the massive support the government had hoped for. The referendum stirred strong interest in the West, with German Chancellor Angela Merkel and U.S. Defense Secretary Jim Mattis among a long line of foreign officials who visited Skopje ahead of the vote to urge Macedonians to back the deal. The agreement faces more hurdles before it can be finalized. If the constitutional amendments are approved by Macedonia’s parliament, Greece will then also need to ratify it. The June agreement aims to resolve a dispute dating from Macedonia’s declaration of independence from Yugoslavia in the early 1990s. Greece, arguing its new northern neighbor’s name implied territorial ambitions on its own province of the same name, has blocked Macedonia’s efforts to join NATO since then. Supporters, led by Zaev, had characterized Sunday’s vote as a linchpin of Macedonia’s future prosperity, the key to its ability to join international institutions. NATO and EU membership would be a major step for a country that less than two decades ago almost descended into civil war, when parts of its ethnic Albanian minority took up arms against the government, seeking greater rights. But opponents painted Sunday’s vote as a clear failure. However, the government had called the referendum consultative and non-binding, meaning it could interpret the outcome as a fair reflection of public opinion regardless of how many people voted. If the referendum were binding, the Macedonian Constitution requires a minimum turnout of 50 percent of eligible voters to be valid. “We don’t recognize any other Macedonia but Macedonia. No North Macedonia,” said Nevenka Ristovska, who was among opponents of the deal celebrating outside parliament, waving red-and-yellow Macedonian flags. Ivana Bzganovic and Nicolae Dumitrache in Skopje and Demetri Nellas in Athens, Greece contributed to this report.